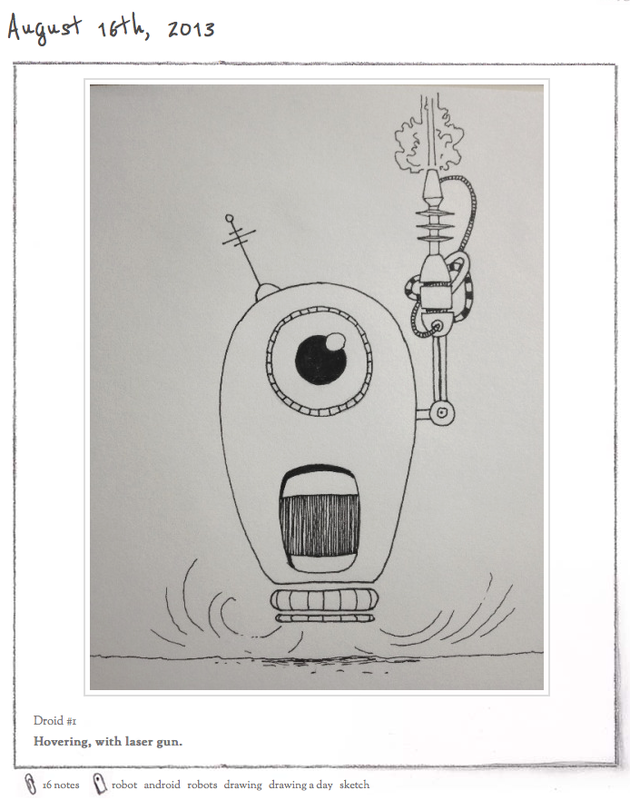 Two years ago today, I posted my first robot drawing and started my Droid A Day project. The beginning of this year-long mission also marks the moment I made a conscious effort to get back in to drawing seriously after a gap of nearly twenty years. I’d started blogging here on WordPress a few months earlier, but my goal to draw and post regularly had fallen by the wayside pretty quickly. The Droid project, and the fact that I posted about beginning it on Facebook and Twitter, gave me a more tangible and focussed reason to draw. Very quickly after starting my daily robots and droids, I realised that even if I got bored, or tired, there was no way I would be able to give up – I didn’t want to fail, and even more I didn’t want to be seen to fail. Sometimes, telling everyone you are going to do something is the best way to make sure you do it. My first robot of the project was a pretty basic affair, drawn in just a few minutes. As the days, weeks, and months passed by, my drawings got more detailed and involved (when time allowed), and I definitely upped my skill levels. Since the project finished I’ve still managed to draw almost everyday, although I haven’t drawn too many robots, and my drawing is still progressing. One of my aims for the project, or at least what I wanted to get out of it was to get in to the habit of drawing daily, because if I want to be a professional illustrator I have to be able to draw when the projects demand, not just when I feel like it. While I can’t say I can draw brilliantly every time I pick up a pen or pencil, I’m definitely getting to the point where I can usually produce something that’s half-way decent, and I’m learning how to get around those artistic blocks and days when you aren’t at your best. I’m still very much a work in progress, and I suppose that’s how it should be – always learning, never satisfied with where I’m at. Am I an illustrator now? I don’t necessarily feel like one, but I have completed the illustrations for a children’s book (out in late September), and completed some illustration commissions. If one measure of being an illustrator is “are you earning money from it?” then yes I am most definitely an illustrator. Two years ago, as I drew that silly little robot with a laser gun, I’d never have thought I’d be at this point by now. I’m making progress. Maybe not as quickly as I’d like, but I’m making progress. Robot with laser gun – the first of 365 robots. 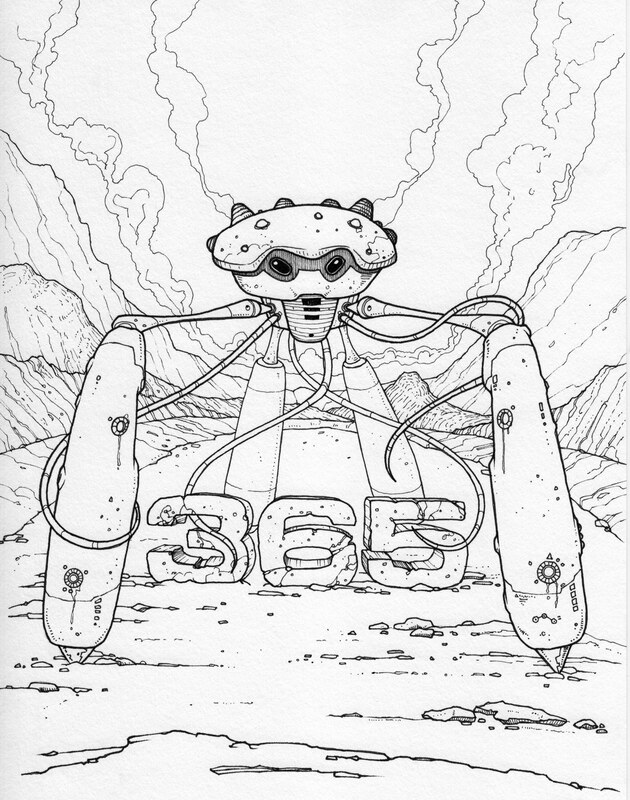 Robot 365 – The final droid of my year-long project. Thanks for this post, it’s very timely and given me renewed enthusiasm to keep going. I’ve been following your drawing on facebook and now I realise the “journey” you are on is similar to the one I’m on, but you are a year and a half ahead of me. I made it my new year resolution to get back into the drawing habit after 10 years away, I really hadn’t anticipated how slow the process would be and how much time would be spent on sales and marketing rather than drawing (and yet I still need the practise)! So, It’s great to read about your successes, and processes, and that you still feel you are learning and progressing, and now I believe my goals are a matter of perseverance…and perhaps a drawing a day challenge. Food for thought. Thank you and Good luck with the new projects.